People always ask us what we do on a daily basis. Today we decided to work on a big list of errands we needed to do. Usually it is hard to get multiple things done all in one day. First thing is we decided to drive since we had so many things on our list. We almost always walk everywhere. We had recently gotten a really big gas bill. 586€ to be exact. For two months. We noticed that 314€ of that amount were taxes(!) so we decided to visit Aimet Luce & Gas which is handily just about 1 minute from our front door. They had been a scary experience when we first got signed up but today they were very nice. They assured us that this tax is imposed on all Italians and is not more for us Stranieri or foreigners. Sigh. Oh well. We have to pony up the money. We next visited our bank. We are trying to change our bank account from one for Stranieri to one for residents. Our bank is the Monte dei Paschi di Siena. It was founded in 1472. Get your mind around that! They bankrolled Christopher Columbus! In order to physically enter a bank here in Italy you must go through an airlock…. Yes, an airlock. You push a button and a rounded door slides back. You enter and it closes and you are in a tube. You then place your index finger on the sensor plate. If you pass, the interior door opens to let you in the bank. I can’t tell you how many times I’ve been stuck in there! We had visited the bank last week and they affirmed that we were being charged a LOT of fees because we have the type of account we have. He said he would work on changing it for us and since we had not heard back went there first. Alas he was not there so we left through the exit airlock. We then went to the pet store to buy kitty litter and food. The people there are super nice and give us the sconto, or discount, when we come. They also signed us up for their new point system! Um… I am not sure this is as great as they seem to think it is but we can earn points and get “stuff” later for the points. Sorta like green stamps… OK I’m dating myself! Anyway… Checked that off our list. 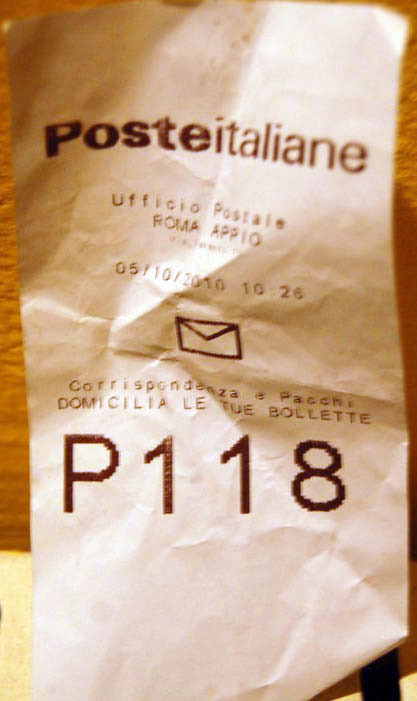 Next we headed to the dread Poste Italiane, or post office. Here you can spend a lot of your life waiting. The post office does not just do mail. You can pay your bills there, also arrange for your permit to stay (in Italy) appointment, and they function as a bank. So when you enter you are confronted with a machine with an array of buttons that you will push depending on what you want to do. They are not always completely clear. I’ve watched Italians punch all four buttons hoping to go to a window and apologize but still get what they want done! Hah! So miracle of miracle we punched the P button and within five minutes had mailed our letter to the US. This is not normal. At. All. We usually spend at least thirty minutes in there whenever we go. I am not really complaining, I enjoy watching the show so to speak. In fact, the people working there (who have jobs for life and cannot be fired) are a sad lot themselves for some reason. They seem to take delight in flying through the numbers really fast. If you don’t jump up when your number is called you are out of luck. I witnessed an old man get passed by because he couldn’t get there fast enough. He resignedly went to the machine for another ticket. So that mission accomplished we headed for our doctors office. This is always an adventure. Our doctor has published office hours five days a week. Usually two hours a day. Heretofore we had gone early, like if her hours start at 9:30am we’d aim to arrive at about 9:15. Only problem with that plan is that she is frequently late…sometimes an hour or more. So today we went later figuring if she was late we’d get there after she had worked through the people waiting. Here in Italy you don’t make doctors appointments. You go during the hours. There are no staff, no receptionist. When you enter there are usually a number of people ahead of you…and multiple doctors use the same building. So you must ask, “who is the last for [doctors name]”? Someone pipes up so you know you go in after he/she leaves. My plan to come later worked as there was just one patient in front of us and best yet(!) the doctor was there. So we got our prescriptions refilled. Next we decided to visit Paulo, Manuelle’s right hand man. He helps with bureaucratic things. We knew our real estate taxes were due next week and he can calculate them for us, then we pay. We were happy to learn that since we just had the one house, and it was our first in Italy, we owe no real estate taxes! Hooray! We did pay last year but Italy passed a law saying first time owners are exempt. Since things were going so well we went over to the car wash. Our car was filthy so we vacuumed and washed it and were off to get some diesel. Then we dropped off our purchases and got our prescriptions filled and parked in the garage. Wow. What. A. Productive. Morning. 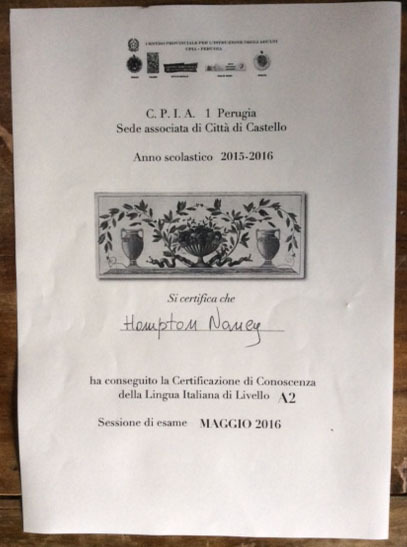 More good news…Yesterday I got my diploma for passing the required A2 level Italian proficiency test! So at least I got that one under my belt. This entry was posted in everyday life in Umbria, Umbertide, Uncategorized on June 7, 2016 by Nancy Hampton. I was in the mood for my first gelato of the year. I got Pistacchio and Nocciola. 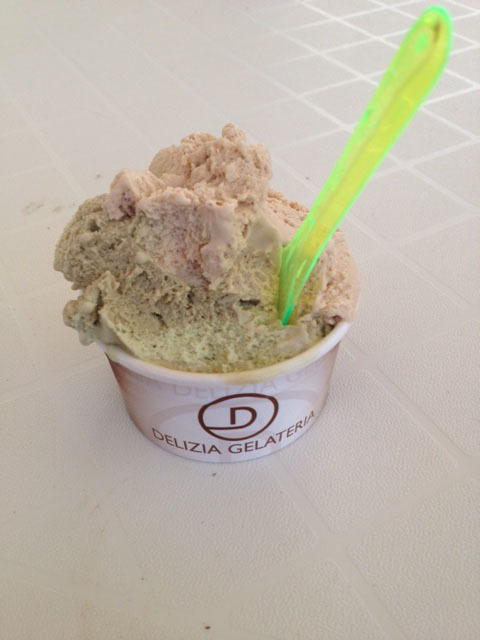 We are lucky to have an artisanal gelato shop called Delizia Gelateria in our town. Yum! This entry was posted in Eating, everyday life in Umbria, Umbertide, Uncategorized on June 4, 2016 by Nancy Hampton.